1. Easily adapts to keyboard tray for left or right-handed users. 2. 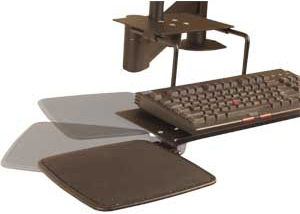 Rotates left or right independently of keyboard tray. 3. Use only with 8066 or 8136 keyboard trays. Mouse tray adaptable for left- and right-handed users. Combine with 8066 and 8136 keyboard trays..